$65.25 per person or two for $115. Just because we’re not in New Orleans doesn’t mean we can’t celebrate Mardi Gras with some style! Get a taste of Bourbon Street, but with Wine at Cork & Cuisine – Mardi Gras on Fat Tuesday, March 5 at 6:00pm at the Owensboro Convention Center! Guests are invited to indulge in five (5) delicious courses expertly paired with fabulous wines and spirits! 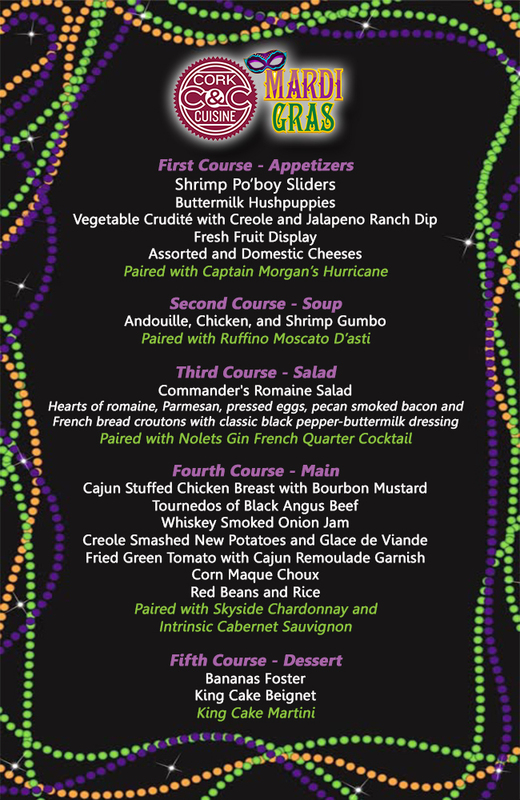 (please see menu below) Special giveaways will also be part of the evening, including a bottle of each of the wines and spirits featured throughout the dinner and some creatively Mardi Gras themed centerpieces courtesy of Ivy Trellis. SOLD OUT! Tickets: $65.25 per person or two for $115. All tickets include all wines and spirits. Additional processing fees apply to all ticket sales. Reservations only. 21 and over only. Sponsored by Southern Glazer Wine & Spirits, Creation Gardens, and Ivy Trellis.